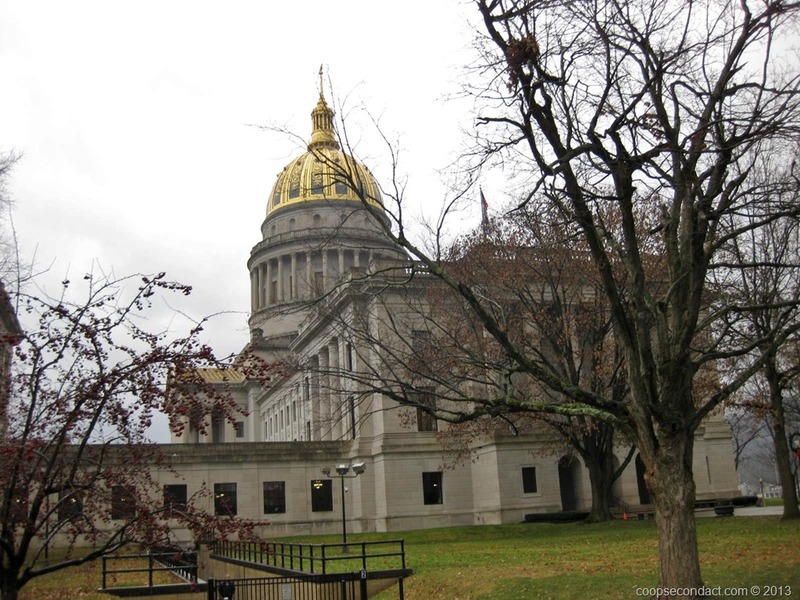 As we headed east through West Virginia, we stopped in Charleston (pics), in order to visit the state capitol building. The capitol was built in three stages. The west wing was completed in 1925; the east wing was completed in1927; and the rotunda connecting the wings was completed in 1932. When you stand in the rotunda and look up into the interior of the dome you will see a beautiful chandelier made with 10,080 pieces of Czechoslovakian crystal. It hangs on a 54-foot brass and bronze chain, weighs 4,000 pounds and is 8 feet in diameter. From the outside you can see the 293 foot gold dome that tops the structure, five feet higher than the dome of the U.S. Capitol. The entire dome is gilded in 23 1/2 karat gold leaf applied to the copper and lead roof in tiny 3 3/8 inch squares. The north and south porticos are supported with solid limestone columns that weigh 86 tons each. 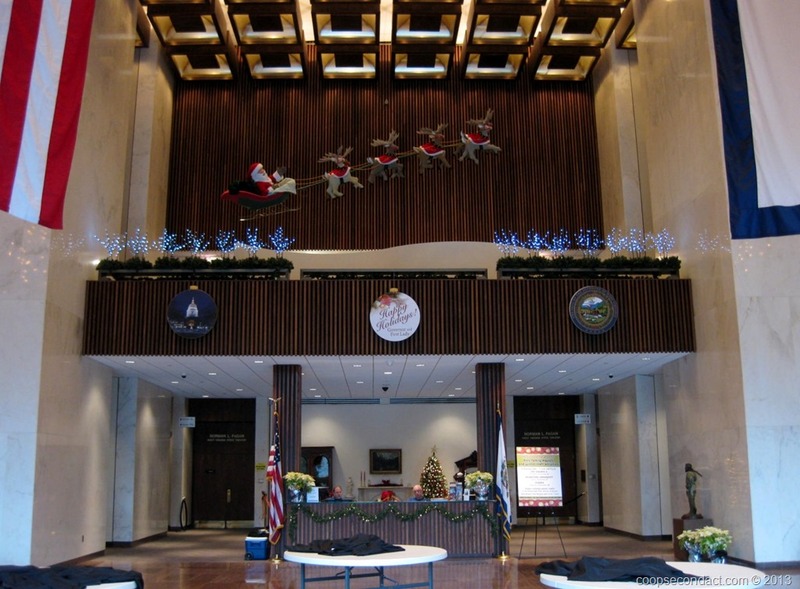 Both legislative chambers have their own chandelier with 10,000 pieces of crystal, weighing 1,500 pounds each. 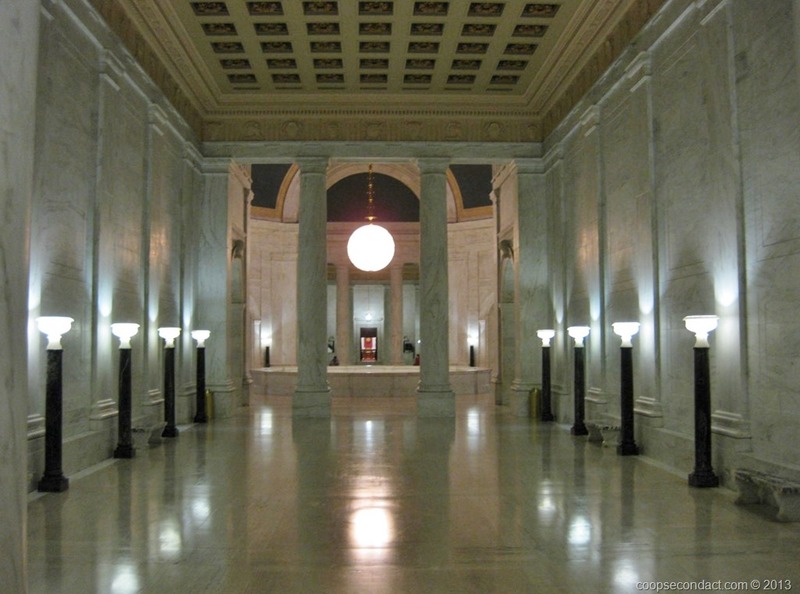 The legislative foyers have massive columns of solid marble that weigh 34 tons each. Across the plaza from the capitol stands the West Virginia State Museum. It offers the visitor a rich experience with detailed dioramas depicting events from the state’s past.